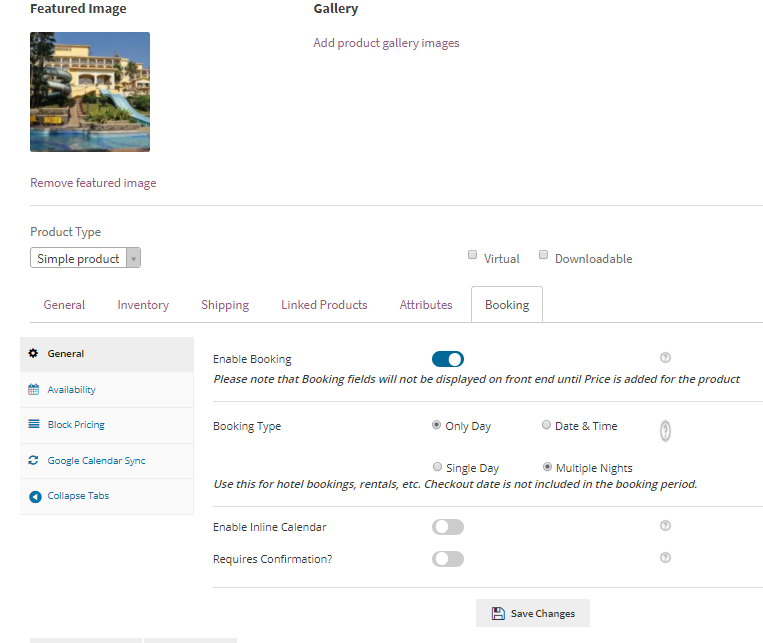 We have released 3 important features in v4.6.0 of Booking & Appointment Plugin for WooCommerce. Firstly, you can assign/book resources for different services and secondly, vendors can sell/book their products online due to compatibility with Dokan Pro plugin. Today we shall discuss the third main feature which is the integration with WC Vendors Pro plugin that works similar to Dokan Pro plugin where vendor’s bookable products can be booked and sold online. 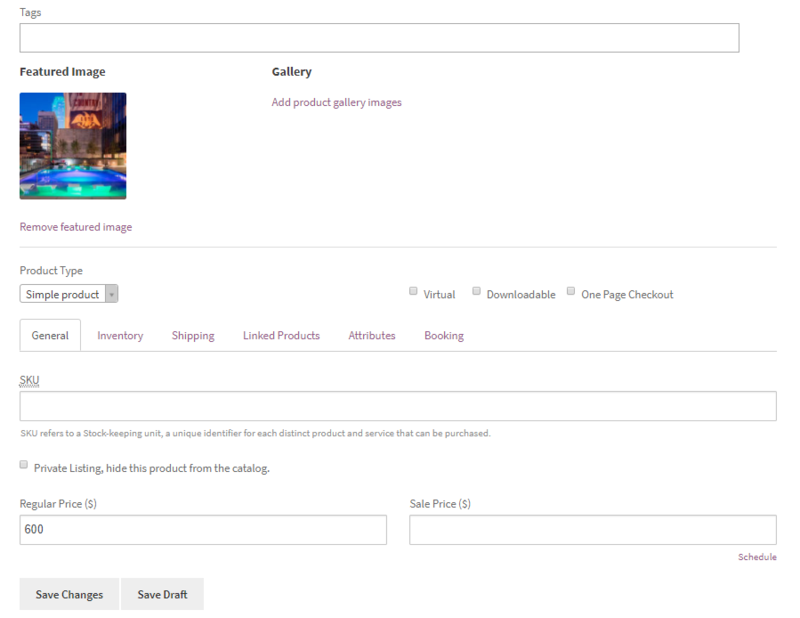 This is a feature-rich plugin that provides a platform for other sellers and vendors to sell all types of products on your WooCommerce store. It is a WooCommerce based Multi-Vendor plugin which facilitates efficient product management, shipping and branding options. Note: WooCommerce v2.3 or greater is required to use this plugin. 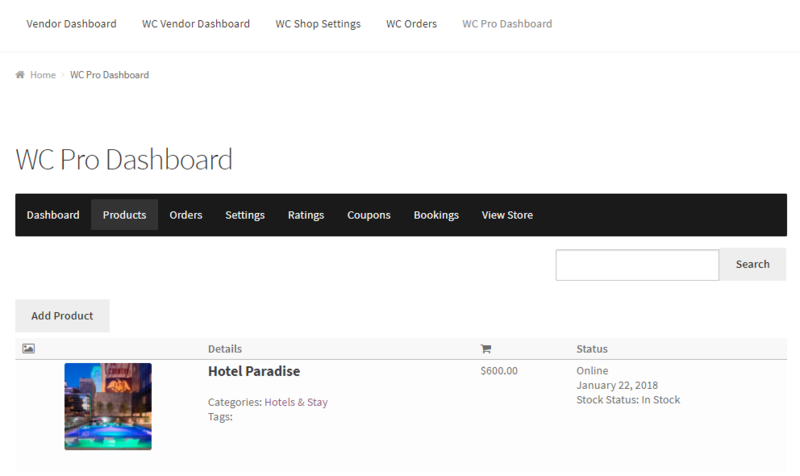 WC Vendors Pro plugin is made compatible with our Booking & Appointment Plugin for WooCommerce which makes all the vendor products enabled for booking. This is because you can add booking settings for all types of products and can also assign level of controls to different vendors. Hence vendors can easily manage all their bookings and orders without having to access the WordPress admin dashboard. This makes selling and booking of products extremely efficient, thereby boosting online sales. There are 2 versions of WC Vendors plugin namely Lite and Pro versions available in the market and you need to install and activate both plugins to start setting up the plugin. As you can see in the above image, WC Vendors landing page has a complete list of settings in different tabs. 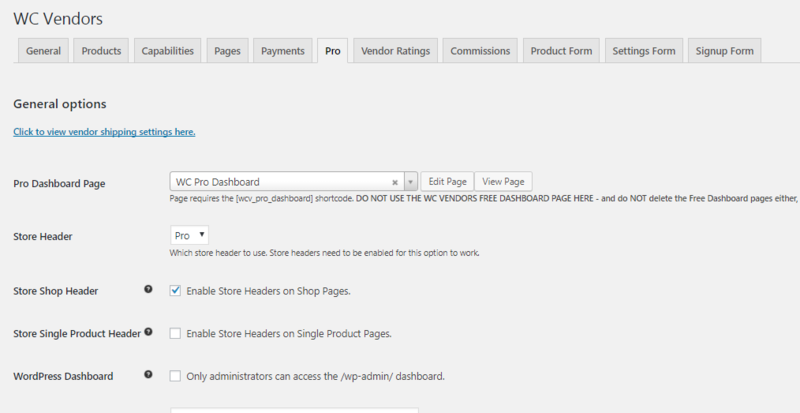 The settings under General tab allow you to set % of commission, registration of vendors, set shop options like Vendor Shop Page URL (this will be yourdomain.com/vendors/store-name/) and display labels. Most important and basic settings required for the setup are adding Capabilities, Pages and Pro settings. 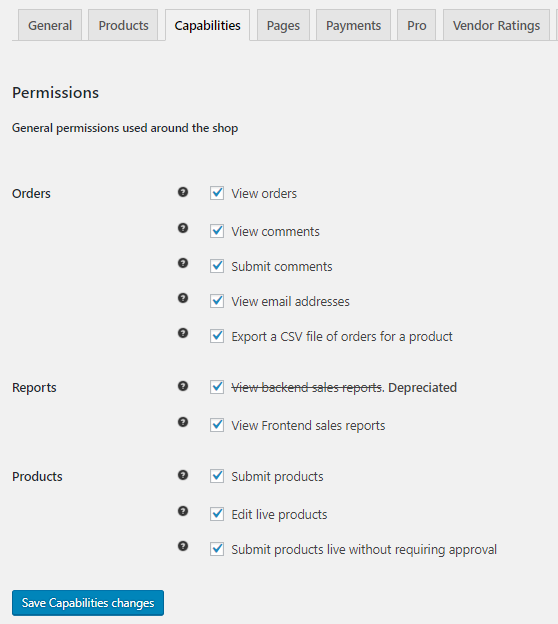 Now let us add pages that the vendor can access to manage his store. These pages are to be created and published manually using the shortcodes specified under Pages tab. 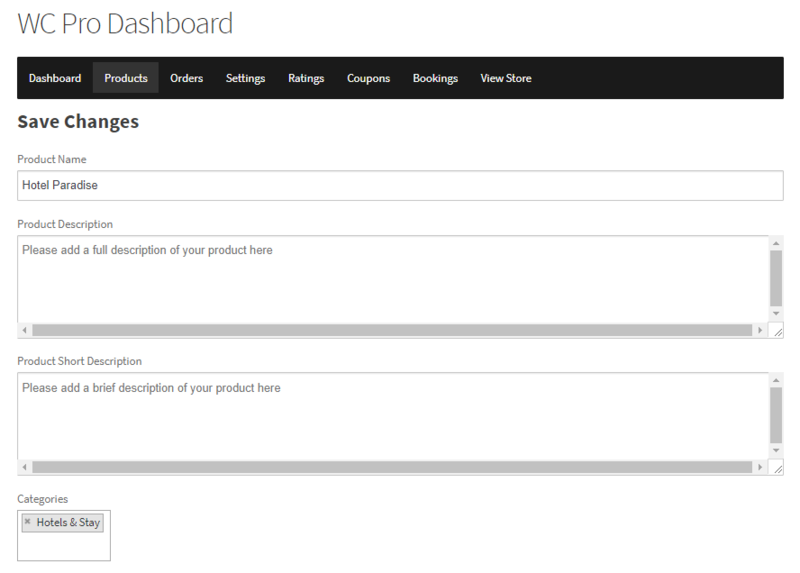 There are mainly 3 pages created under WooCommerce -> Pages namely Vendor Dashboard, Shop page and Orders page. 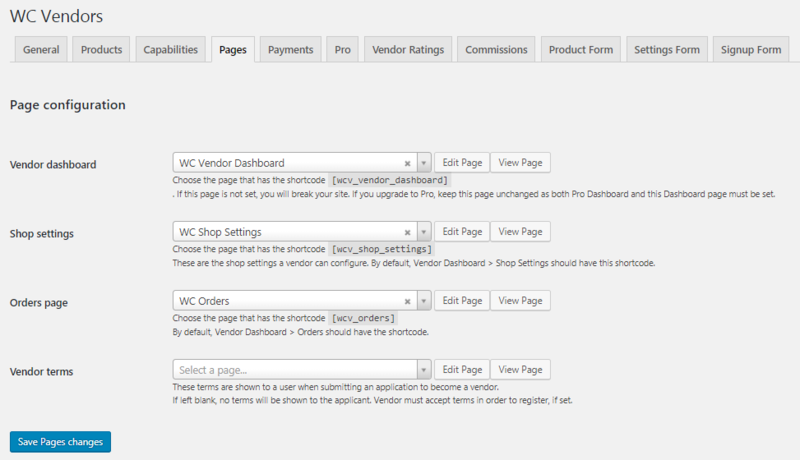 These pages are then published so that you can manage the page configuration action under WC Vendors section. Since, we’re using the Pro version of the plugin, we need to create a dashboard page for the vendors from which they will be able to manage their store. For doing so, we will go to the Pro tab under WooCommerce -> WC Vendors. Once these pages are added you will have access to these pages in the vendor login. In order to access the site as a vendor, we first need to add a user with the role ‘Vendor’. 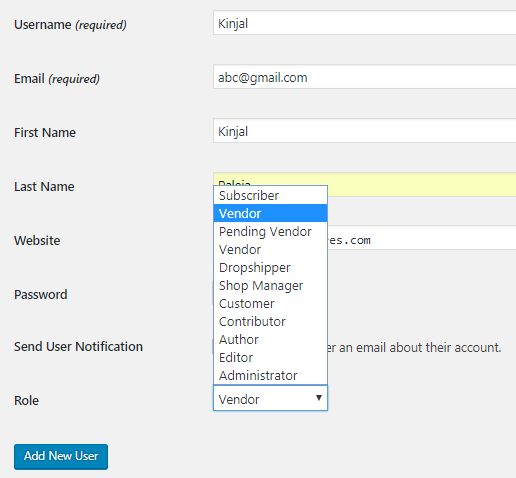 For adding a vendor, you will have to go to Users->Add New page add all the user details like name, website and assign a role. You can assign a role to the user by clicking on Role dropdown and select Vendor from the displayed list as shown above. 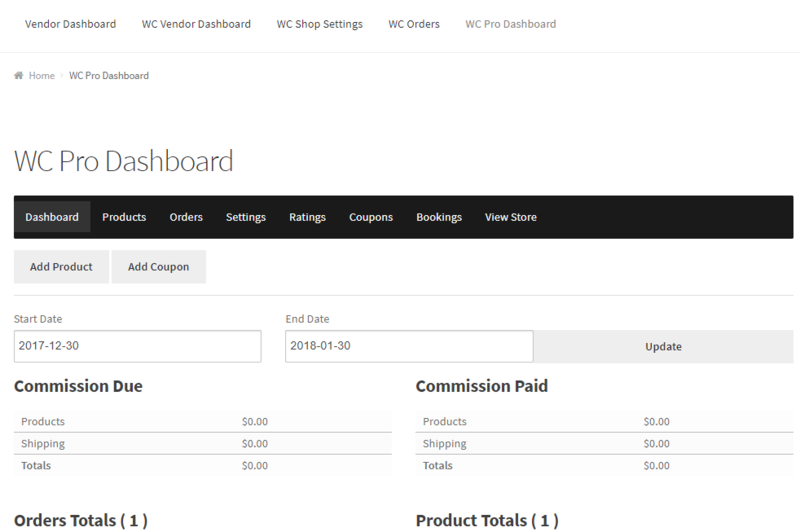 As you can see, the WC Pro Dashboard page is selected and hence the dashboard details appear. Once a vendor has been created, you can assign this vendor to the products. 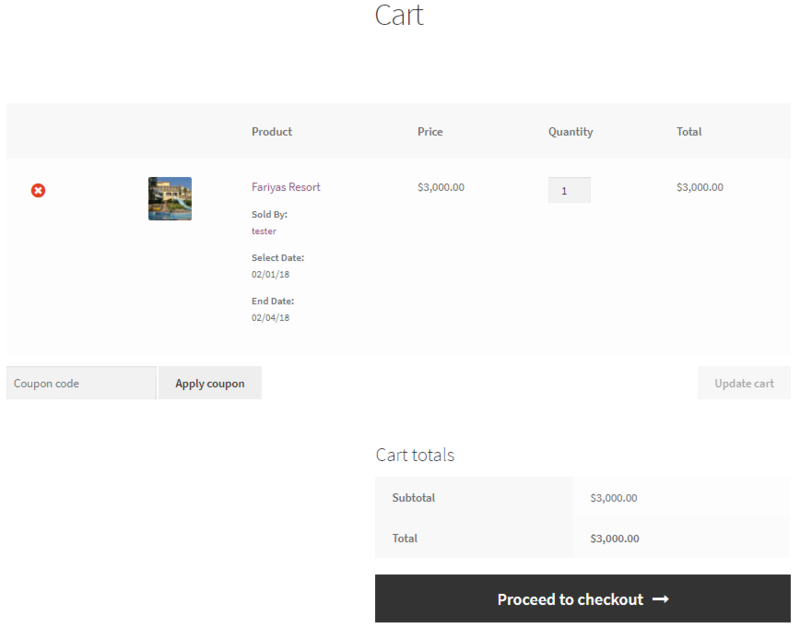 When you click on the Edit option, you will land on the Edit Product page. You can make suitable changes here and click the Save Changes button. When you click on the Add product button on Vendor Dashboard, you get directed to the Add Product page where you add details of a new product. 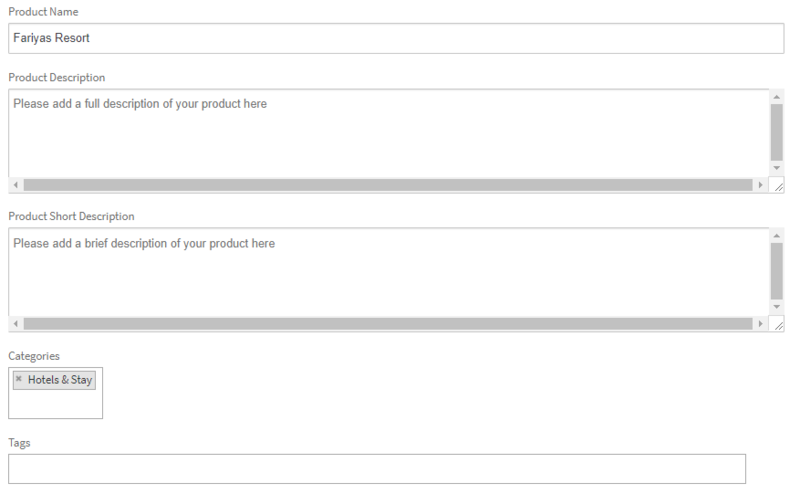 Note: The product needs to be saved once before you are able to create booking settings. Once you have added all product and booking details, you will now be able to configure bookings and place an order for this bookable product. 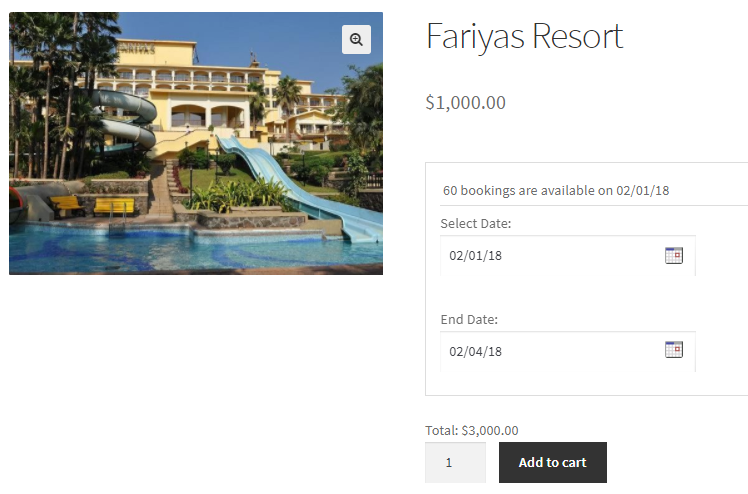 As you can see, Resort Fariyas is booked for 3 nights from 1st February to 4th February, 2018 for total cost of $3000. Click on the Add to cart button to book this product. 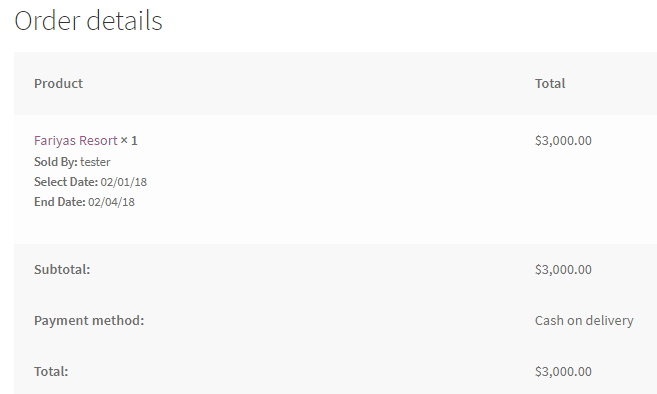 When you click on the View & Edit button, you will get to the Edit Bookings section where you can make the desired change and click on Confirm Bookings button to save it. 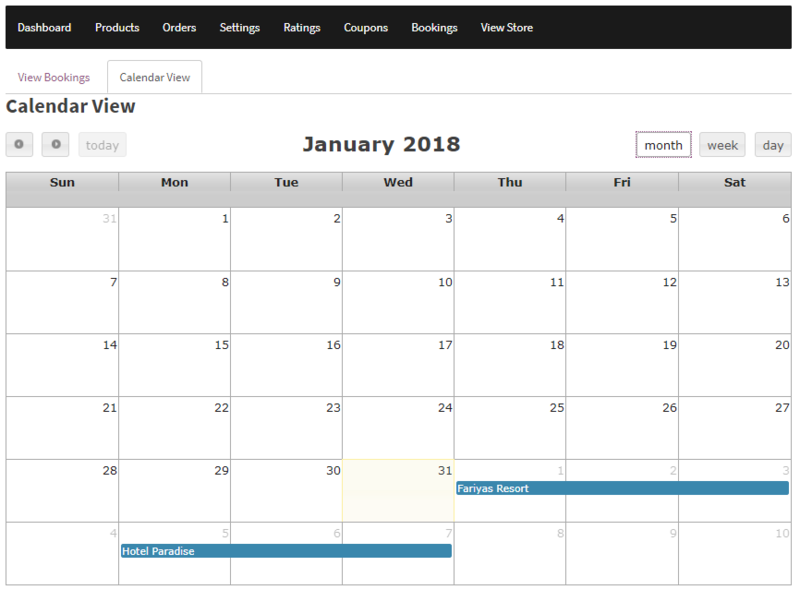 For our above placed order for Fariyas Resort for 3 nights, below is the calendar view of the booking shown under the Calendar View tab. Moreover, Vendors can also export their bookings to google calendar by following the product level gcal setup. 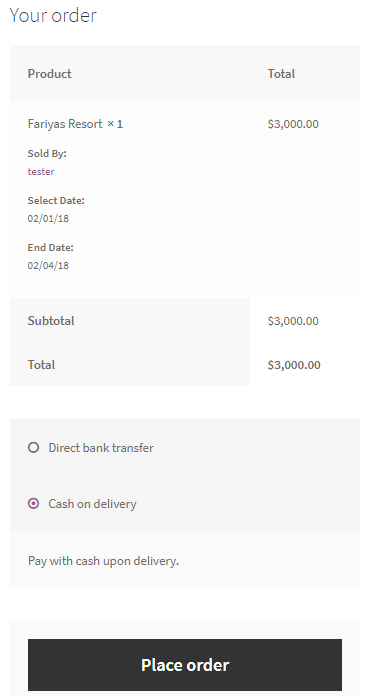 This is the entire booking process associated with vendor specific products when our Booking plugin is made compatible with the WC Vendors Pro plugin. 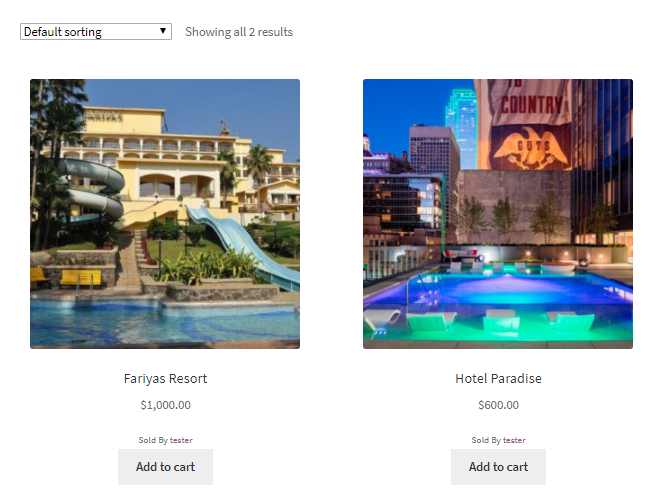 In the entire post, we discussed how the compatibility of WC Vendors Pro plugin with Booking & Appointment Plugin for WooCommerce has proved to enhance the performance of online bookings for vendor specific products. With this integration, selling and booking products/services has become more efficient and this opportunity for vendors helps them increase sales and boost the overall online revenue.